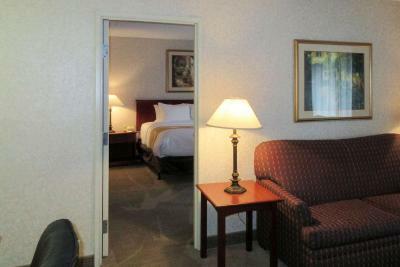 Lock in a great price for Quality Inn & Suites Albuquerque – rated 8.1 by recent guests! The breakfast was okay. The pool looked nice. Jim was helpful. 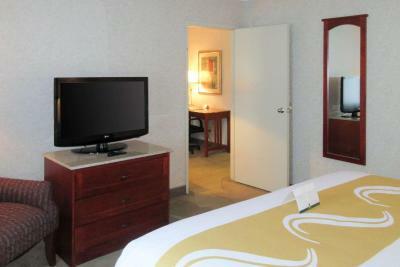 Other then the mattress stain-"Cleanliness of the Room"
Breakfast was fresh, staff was very friendly. Plenty of parking and close to the freeway. The bedding was old but clean and mattress was newer. The location is near the freeway. Breakfast was included, as well as two free drinks tickets to their bar on property. We missed breakfast because we slept so good. No noise so we rested well. I would love to stay here again and suggest this establishment to my friends and family. Excellent service. Front desk Was very helpful when I needed hep. Clean, clean, clean. An old property that has been beautifully remodeled, with carpets gone and clean, attractive wood-type floors installed. Great location. Roomy. 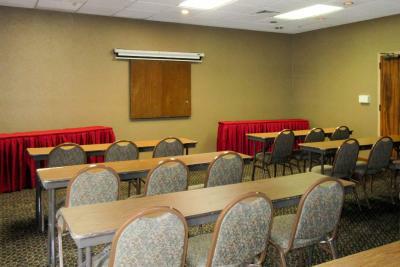 The rooms are spacious n the bed was comfortable..
Quality Inn & Suites Albuquerque This rating is a reflection of how the property compares to the industry standard when it comes to price, facilities and services available. It's based on a self-evaluation by the property. Use this rating to help choose your stay! One of our best sellers in Albuquerque! 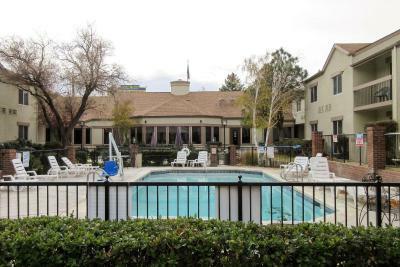 A 10-minute drive from the city center of Albuquerque, this hotel offers free transfers from Albuquerque International Sunport Airport and within an 5 mi radius from the property. Guests can enjoy a seasonal outdoor pool, a restaurant and a bar. 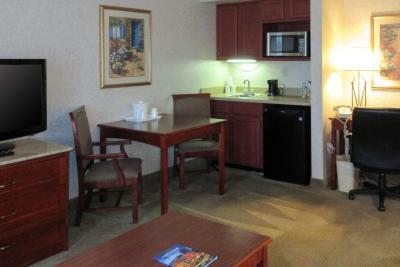 Each room has a flat-screen cable TV, a microwave and a small refrigerator. A coffee maker and a private bathroom are also included. 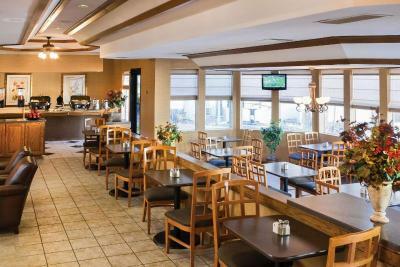 Clubhouse Inn & Suites features a free hot breakfast with hot scrambled eggs, yogurt, biscuits and gravy and more. Guests will also appreciate the free nightly cocktail hour, which consists of beer, wine, soft drinks and free popcorn. 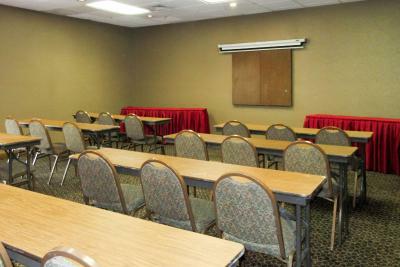 Kimo Theater is 2.2 mi from Quality Inn & Suites Albuquerque. The property is 1.9 mi from Albuquerque Convention Center and 2.1 mi from Greater Albuquerque Chamber of Commerce. This property is also rated for the best value in Albuquerque! Guests are getting more for their money when compared to other properties in this city. 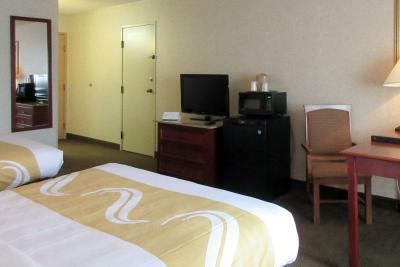 When would you like to stay at Quality Inn & Suites Albuquerque? 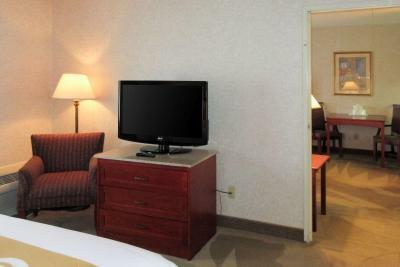 Featuring free WiFi, this room also offers a flat-screen TV with premium cable channels, a microwave, a small refrigerator and a coffee maker. A private bathroom is also included. 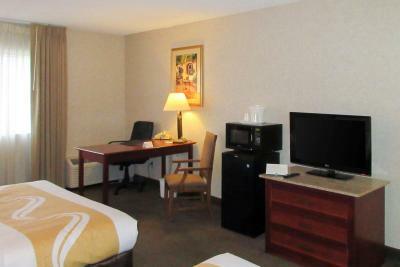 House Rules Quality Inn & Suites Albuquerque takes special requests – add in the next step! Quality Inn &amp; Suites Albuquerque accepts these cards and reserves the right to temporarily hold an amount prior to arrival. Quality Inn & Suites Albuquerque accepts these cards and reserves the right to temporarily hold an amount prior to arrival. Please note that the shuttle is available from 07:00 until 18:00. The non smoking room smelled like smoke. The room wasn't kept in good repair. It was in an awkward location. Electric outlet by sink kept snapping off. Had to reset alot. Entrance C, electronic door not working/didn't work with issued card. Stain on mattress! Carpet not cleaned and smell like pet stay there. No grassy area for my dog to use the bathroom. I was told when I stayed here another time that they were goi g to make s dog area but they haven’t done that yet. Our bathroom toilet was filthy it had pubic hair and other unidentifiable matter I had to wash off the toilet seat. The floor, curtains and walls had possible decal matter on them or some other gunk. I didn’t sleep well worried that I felt something crawling me it just gave me the hebeegeebees! Noisy neighbors were up all night with the TV blaring. Thin walls. We wish breakfast had started earlier. We were already on the road when breakfast started at 7 AM. 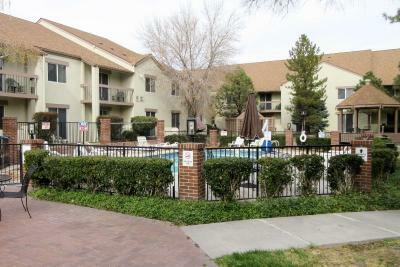 Great access to both I-40 and I-25. Breakfast was poor. Didn’t even have any milk for cereal. My iron was broke wires showing where water enters. I called the front desk for another and was told they don’t have backups. Beds were lumpy and uncomfortable! The next day I checked our room to make sure we didn’t leave anything. Seriously! Under our bed was fast food left by another guest. Disgusting! Nothing was like the pictures on their hotel booking sight. Rooms were old n dingy. 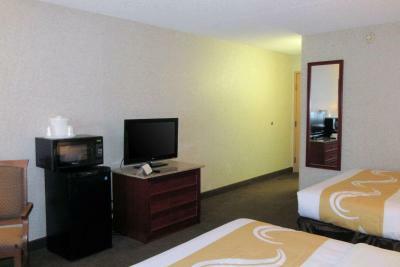 Nothing remodeled like they advertised.at least the room we had. Didn’t feel fresh n clean. The door near my room did not always unlock with my keycard. Had to go get a new one. Then, the door entry completely didn't work so I had to go to the other side of property to enter.